Published Bestsellers: Reviews of 'In Search Of Ireland Again'. "Want a trip through Ireland with a congenial companion? 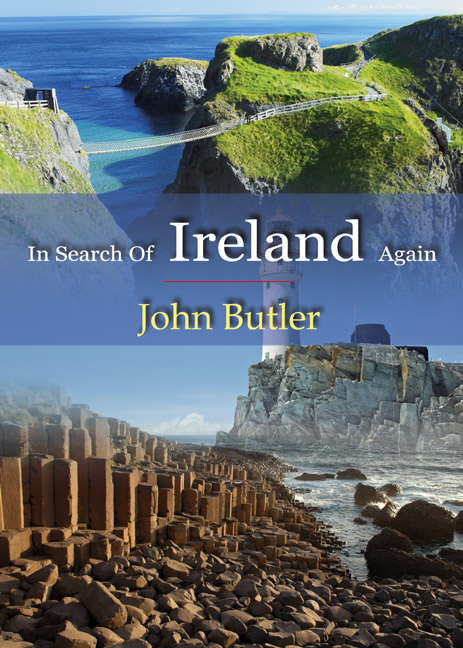 Here's someone with a feel for landscape and its moods; for Ireland past and present (sharing its woes, hoping for better things); for a myriad places where history and memory interweave... John Butler raises innocent questions with his host, but can't suppress shrewd comments. He enjoys the cosmopolitan encounters of the tourist trail. And all this is a stream of succinct, sharp observations." "It was a great surprise and pleasure to receive your lovely book, as a present from our friend. We spent 14 happy years living in County Antrim (1965 - 79),and had holidays in Connemara and Co. Kerry so your book is of great interest to us. I have to tell you that I read it from cover to cover in one go- it was so compelling, and learnt more about the history, and complex politics than during our time living there! Thank you for our treasured copy, which our son and daughter will also find absorbing, as they grew up in that beautiful place."